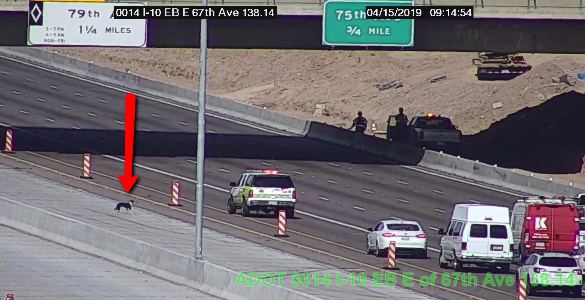 PHOENIX (3TV/CBS 5)-- A driver and several Arizona Department of Public Safety troopers were able to rescue a dog that was on the loose on a Phoenix freeway Friday morning. The incident took place just after 9 a.m. on westbound Interstate 10 near the 67th Avenue exit. According to the Arizona Department of Public Safety, they received several calls from drivers who spotted the four-legged animal in the area. The dog ended up walking eastbound in the westbound lanes in the construction closure away from traffic, DPS said. ADOT cameras captured the moment a driver stopped their car and helped troopers get the dog to safety. The dog will be turned over to the Maricopa County Animal Care and Control. Sorry folks, no daily special at the Road Kill Cafè today. Ur stupid u should b road kill.